Give a set of steak knives to the average woman, we’re likely to give you the this-gift-is-really-for-you-isn’t-it look. But, you give the average steak-loving man a quality set of steak knives like our new Hammer Stahl knives and you’ve just become his favorite kid or spouse! Much like the average woman, I normally wouldn’t care about any sort of knife except a butcher and a paring knife. Those are my two favorite with which to prepare food. 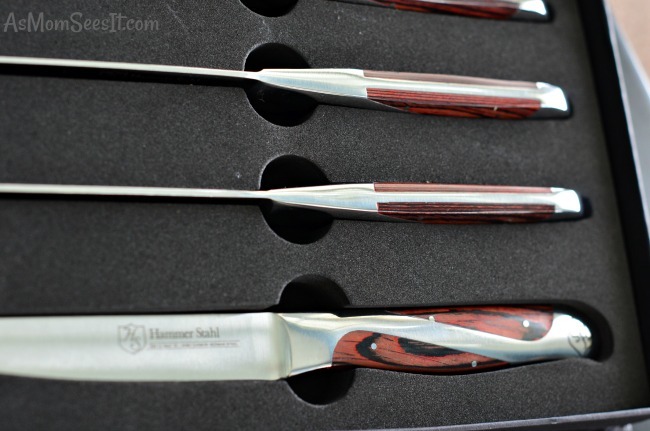 But this 4 piece steak knife set from Hammer Stahl are really handsome! 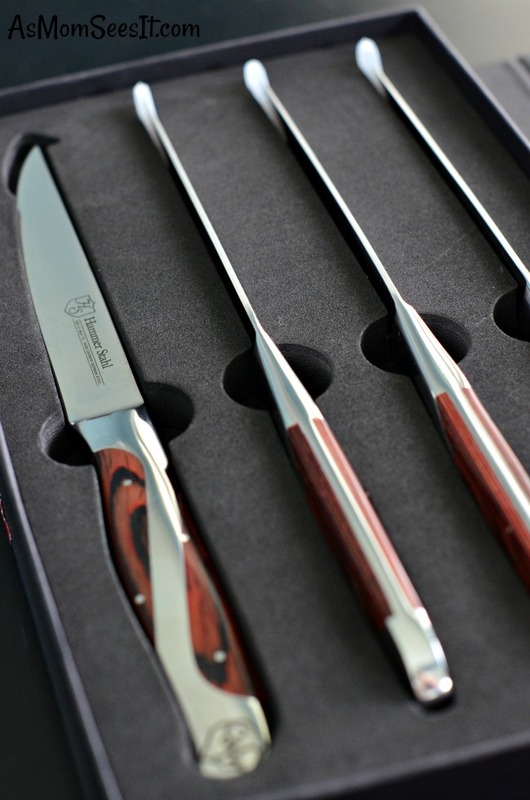 Give anyone these steak knives as a gift, you’re likely the best gift-giver ever! I first learned about Hammer Stahl products when I attended the International Home & Housewares Show in Chicago. Most of what you’ll see there is cutting edge, top of the line products. Most of what you’ll see in our butcher block is the average set of knives that you can buy at Target. Not that there’s anything wrong with them, but when you cook – or love to cook – as much as I do, then you need to sometimes step up your game. Hammer Stahl is a game changer as far as their cutlery. From their steak knives to their chef’s knife, their cutlery is made from top-quality German high carbon stainless steel. Their pieces are forged and tempered to provide a superior edge and long lasting durability. You’ll notice the quality of Hammer Stahl knives as soon as you pick one up. The razor sharp edges are precisely measured by laser for a world-class cutting edge. The blades are sharpened to a 20 degree bevel angle. Their steak knives feature a loped bolster to provide a comfortable grip and their Pakkawood handles are infused with phenolic resin that combines the beautiful look of wood with the durability of plastic. They’re also well-balanced and oh my gosh do they cut through a good steak like buttah! I also LOVE how many of their knives, including this amazing steak knife set, comes in a beautiful gift box with a magnetic latch. I was torn between keeping these stunning knives in their box, not daring to let anyone use them, or hanging them from our magnetic knife rack, not dating to let anyone use them. I will telly you, though, it’s much less embarrassing sharing these knives with guests than it was sharing our rusty old dull steak knives. 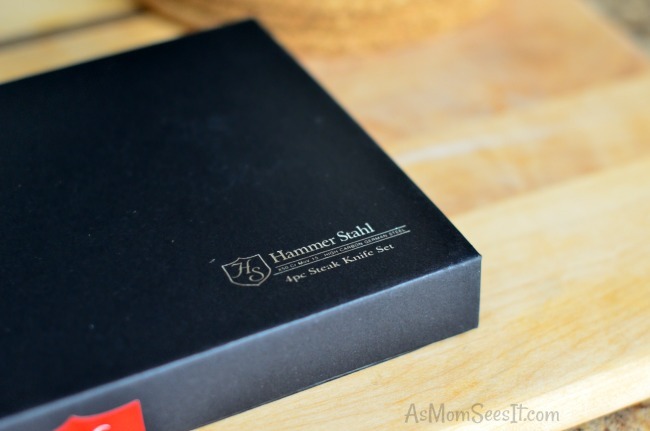 We received these knives from Hammer Stahl to facilitate our review. All opinions are our own and were not influenced in any way.